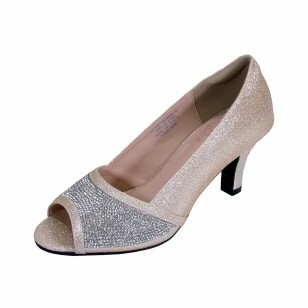 FLORAL Noemi women extra wide width slip-on open-toe dress pumps is super elegant with sparkling rhinestones on the vamp. This ladies 2.5" mid-heel features a metallic upper along with an extra cushioned insole and a padded closed back. Its outsole is made of durable and lightweight rubber materials for maximum surface grip to give you support when you are dancing at your next party.